Guangdong is a pioneer in the reform of the Chinese economy and one of the most developed provinces in China (OECD, 2010). The provincial government of Guangdong plans gradually to establish a green energy system. In late 2010 the government set a target to reduce carbon intensity and a pilot carbon emission trading scheme has started from 2012. However, by March 2010, 16GW of ultra supercritical pulverised coal power plants (USCPC) with a unit size of 1000MW were already in the construction stage, while an even greater amount of large coal-fired power plants are pending for approval. The implementation of CCSR concepts in these plants to ease subsequent retrofitting to CO2 capture therefore becomes an urgent task in Guangdong. This study addresses the technical, economic, financial and stakeholder acceptability aspects of CCSR in Guangdong and investigates potential drivers and barriers to implement CCSR in Guangdong immediately. 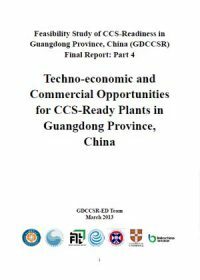 The project “Feasibility Analysis of CCS-Readiness in Guangdong (GDCCSR)” was launched on 18 March 2010 and will run to March 2013. It is aimed at scientifically investigating if CCS is needed and feasible in Guangdong, and to suggest roadmap and policies for its development. 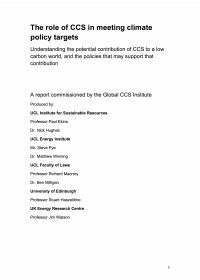 This report examines the project’s progress to date and discuss future works in the areas of energy consumption and emission profiling, CO2 storage assessment, cost analysis and estimation, capture ready promotion, and capacity development and public awareness.